Now, I love Giada, but Jason and I, without speaking a word, exchanged a look that said, Todd and his buddies are going to be pissed when Squid Stew and Swordfish Sandwiches replace chili and sliders. A compliment under any other circumstances, I knew he wasn’t talking about my figure and that he was right. There was only one solution: we needed wings. These two recipes were designed to showcase two special vinegars available at Sapore, and they are available online. They are sweet and spicy, sticky, rich, tender and moist. We’ll even cook a few extra for Todd. This is based on Sapore’s wonderful, seasonal Cinnamon Pear Balsamic Vinegar. Order it online or use the substitutions I suggest below. *To substitute, add 1/2 cup balsamic vinegar, 1/4 cup pear nectar and 2 cinnamon sticks to a small saucepan and simmer until liquid is reduced to 1/2 cup. Whisk together marinade ingredients. Place wings in a ziplock bag and toss with 1/2 cup of the marinade. Refrigerate for 2-4 hours. Place wings in a single layer on a foil-lined baking sheet. Don’t skip the foil. The sugary marinade will caramelize and make a mess on your unlined sheet pan. Cook for 30 minutes, turning once. If roasting two pans at once, switch positions in the oven at 15 minutes. While wings cook, place remaining sauce in a saucepan. Bring to a boil, reduce to medium and let bubble away for 10 minutes until thickened. When wings have cooked for 30 minutes, brush with sauce and return to oven for 5 minutes. Remove from oven and sprinkle lightly with salt. 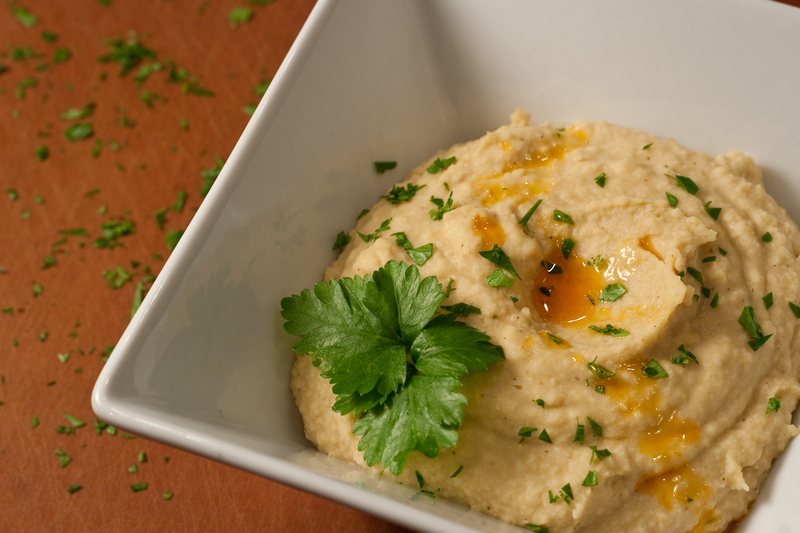 This is based on Sapore’s versatile Serrano Chile Honey Vinegar. The vinegar is made from fermented honey and is wonderful with Asian, African and Asian recipes. Order it online or use the substitutions I suggest below. *Try a good quality Sherry vinegar instead of the Serrano Chile Honey and substitute puréed chipotle in adobo for the Sriracha to get some smokey flavor. Mix together marinade ingredients. 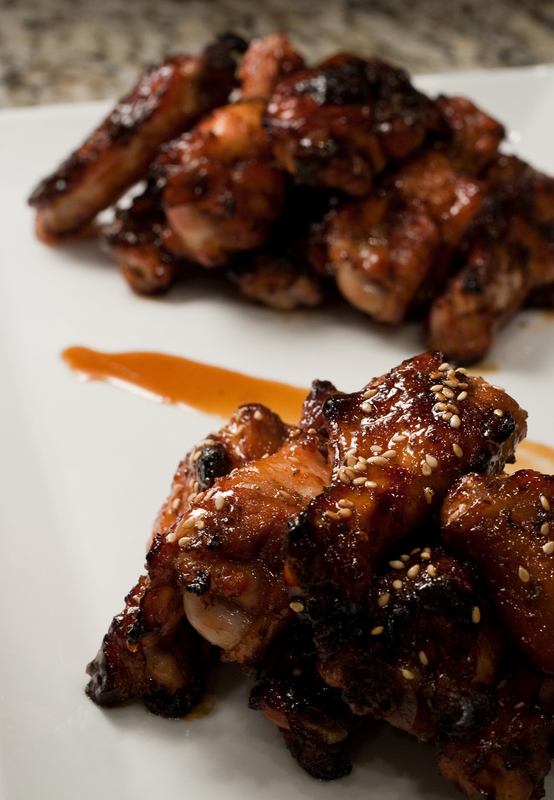 Place wings in a ziplock bag and toss with 1/2 cup of the marinade. Refrigerate for 2-4 hours. 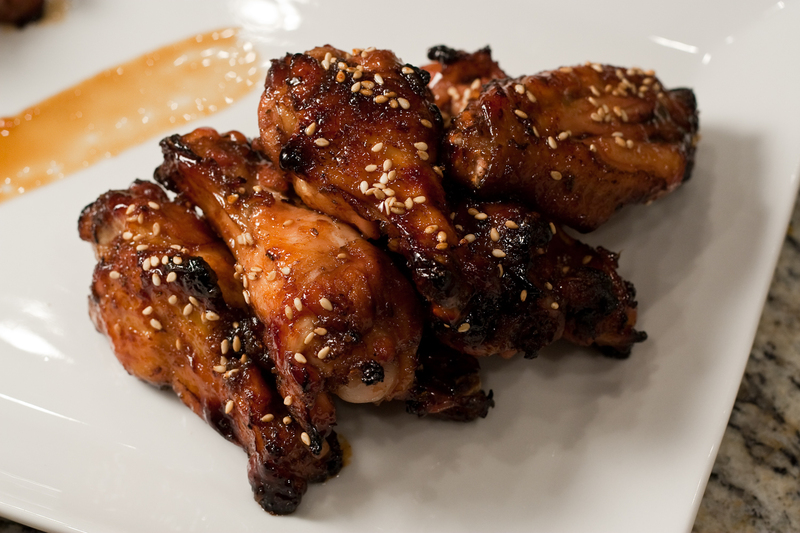 Remove wings from oven, brush again with sauce and sprinkle with sesame seeds. Join me in the kitchen!